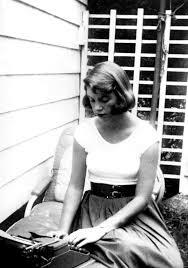 I’ve been fascinated with Sylvia Plath since my college days in the early 1970s, when I first read her startling poems, “Lady Lazarus” and “Daddy,” in a lit class. Shortly thereafter, I read her novel, The Bell Jar, and her posthumous poetry collection, Ariel. I wrote my senior honors thesis about Plath, without knowing much about her except that the poems and the novel were highly autobiographical. Plath was catching on like a rock star at that time, especially among young students. The novel had been released in 1963 in England, where she was living, shortly before her death by suicide. It had been turned down for publication in the United States, but a few bootlegged copies eventually arrived on these shores, and created a demand for it that the publishing industry couldn’t ignore. Why did this story appeal to college students in particular? It’s the tale, thinly disguised as fiction, of Plath’s first suicide attempt when she was a scholarship student at Smith College. Many of us remember our college years as a time of self-discovery, but also great uncertainty and self-questioning. Even if we made the grade academically, we had plenty of reason to doubt that the job market would embrace our skills. Stable relationships were tough enough to develop and maintain during those four years, much less to carry into adult life. The Bell Jar captured all of these struggles and more. Sylvia Plath seemed to have a compulsion to dramatize her life in minute detail, both in journals and in voluminous letters to her mother and many friends, boyfriends, and acquaintances. She supplemented these with scrapbooks and calendars. It’s as if she knew that her every passing thought would be parsed by scholars later. I am now reading The Letters of Sylvia Plath: Volume I, 1940-1956. (The second volume, covering the rest of her life, will be released in late 2018). It’s a humongous book, almost too heavy to hold. It makes you wonder how she found the time to write so much, although she evidently wrote these letters fast, without stopping to edit. The book even preserves her hasty mistakes. She did all this self-chronicling while carrying heavy academic loads and many extra-curricular activities at college. Her summer jobs were strenuous as well. She felt compelled to get straight As, or close to it, in order to justify the generous scholarship help she received. Her dating life was active, almost frenetic. She had a habit of forming intense attachments to both men and women, which often ended in disillusionment. Of course, she took her revenge by expropriating many of these relationships for fictional and poetic purposes. Plath’s journals reveal more of her inner life than the letters, which mostly present the face she wanted to show to the world. On the surface, she was a busy, happy young woman, blessed with intelligence, good looks, and plenty of male attention. She suffered many rejections for her writing, but managed to get a fair number of acceptances, enough to build quite an impressive publication record for someone of her tender years. Also artistically gifted, she illustrated many of her letters. She had a talent for color and design, as demonstrated by her exact descriptions of clothes and her knowledge of fashion. She dressed as tastefully as her limited budget would allow. Once in a while her frustrations and darker moods burst through the narrative, but they seem like the typical young-adult angst we all experienced. You might suspect her of exaggerating some of her obstacles just to prove she could conquer them. For example, in a near-hysterical letter to her mother, she described her struggles with a required science course that grated on her because it was far removed from her interests. “I really am in a state of complete and horrible panic … I have practically considered committing suicide to get out of it.” Predictably, she would end up acing that course. Other letters described the hellishness of a summer waitressing job while she was in the midst of it. When she became ill with a sinus infection and had to quit the job, she looked back on it as an idyllic time during which she met many fascinating people. If we didn’t know otherwise, we probably wouldn’t detect a real self-destructive urge between the lines. Yet her first attempt, during summer vacation after her junior year at Smith, was no bluff. She took a whole bottle of sleeping pills and then hid herself someplace where she thought no one would find her … and for two days, despite frantic searching, no one did. She had had a series of setbacks during and after that academic year, which are described in the novel. She was rejected for a prestigious writing course she had hoped to attend that summer. She was disappointed with her primary boyfriend, a medical student, who had been unfaithful to her but still expected her to marry him, become a conventional doctor’s wife, and put writing on the back burner. And what appeared at first to be the big professional break of her life, a guest editorship at a young women’s fashion magazine, turned out to be a disillusioning experience. The tedium of that job, which sapped her energy and left her no time for creative work, seemed to close off a major career possibility. The letters paint a picture of a close, loving relationship with her mother. The reality of the relationship was more problematic, as can be seen in the poems and novel. Those are quite unforgiving, even cruel, to the central person in her life. Aurelia Schober Plath was a single mother, widowed while still young and left financially insecure. Nevertheless, she strove to give her two children the best of everything. Plath was not ungrateful. Certainly she was sincere when she wrote to her mother, “You are the most wonderful mummy that a girl ever had, and I only hope I can continue to lay more laurels at your feet.” Yet the novel’s depiction of her also rings true … well-meaning but clueless, unable to understand what her daughter was going through in her darkest moments, and helpless to prevent her breakdown. For that matter, the medical profession served Plath poorly. By today’s standards, the failure to properly diagnose her condition, and the initial, badly administered shock treatments that made things worse, bordered on malpractice. It took her a long time to find a sympathetic psychiatrist, a young woman whom she kept in touch with for the rest of her life. She recovered from her early breakdown, and went on to many impressive accomplishments, but the experience lingered. At the conclusion of the novel, she foresees that the stifling bell jar, a metaphor for her distorted view of the world, might descend on her again at any time. Not surprisingly, given her perfectionist nature, Plath looked for a mate who would combine all the traits she valued in her previous relationships. Her ideal, she told her mother, was to combine the athletic body of one suitor with the incisive mind of another. While studying on a Fulbright scholarship at Cambridge University in England, she met the man who seemed to embody all that she was looking for, the poet Ted Hughes. She had already read his poetry, and he had read hers, which must have made their love seem predestined. She fell madly in love, proposing to him after only three months’ acquaintance. She was aware of his reputation as a ladies’ man, but that quality no doubt excited her, at least at first. She was certain she could provide the stability he needed to make him the man she envisioned. Her letters to him were full of endearments, variations on “Dear, darling Teddy.” In an early one, she wrote: “You are my own self for which I exist, somehow being father, brother, husband, son, in all one, the whole male principle of the world, in you, and without you how barren that world is, and sterile.” Maybe a little too much for any man to live up to? Plath was intensely ambitious before that quality was in vogue for women. This was the 1950s and early 1960s, a time when most women led conventional lives. Very few were “leaning in,” or shouting “Me too!” in a man’s world. Plath was always insistent about wanting children, and lots of them. She believed her writing would enhance her life, but her family would be her life. At first her marriage to Ted Hughes seemed to work. He enjoyed more professional success than she did, which seemed right to her, as long as she could find her own niche. She sold her first poetry collection to a British publisher when she was eight months pregnant. The birth of their first baby did not seem to impede their progress. It was not until the second child was born that Hughes evidently felt crowded by domesticity, and his former lothario persona began to reemerge. Sylvia Plath’s story leaves us guessing whether it is possible for a woman to have it all. She recovered from the suicidal depression she suffered at age 20, and held off the demon for ten highly productive years afterward, but she never learned to reckon with her perfectionism. I’m familiar enough with the rest of her story to know that she continued to write letters full of plans and bravado almost until the end. But that narrative of a perfect life, always elusive, finally rang hollow.